Good morning! I am typing this post from a hotel room … the hubby and I are on “spring break”. We are not college kids, but the parents of a college kid left at home to go to work and school while we have fun! I like this version of a spring break and highly recommend it 😉 These little pops were made the night before we skipped town. 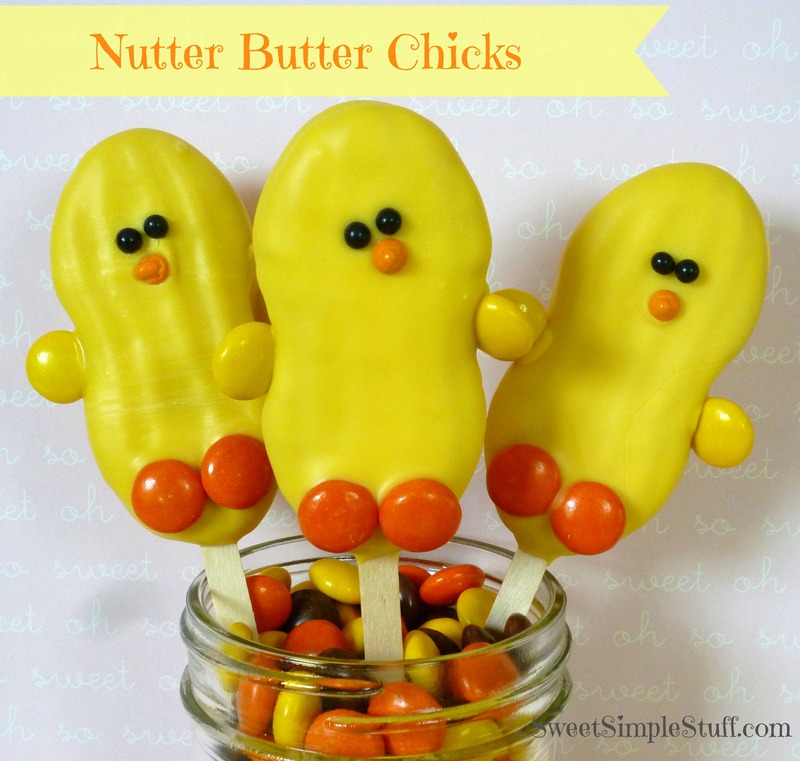 It has been a year since I made Nutter Butter Chicks … they grew up … into Nutter Butter Chickens! 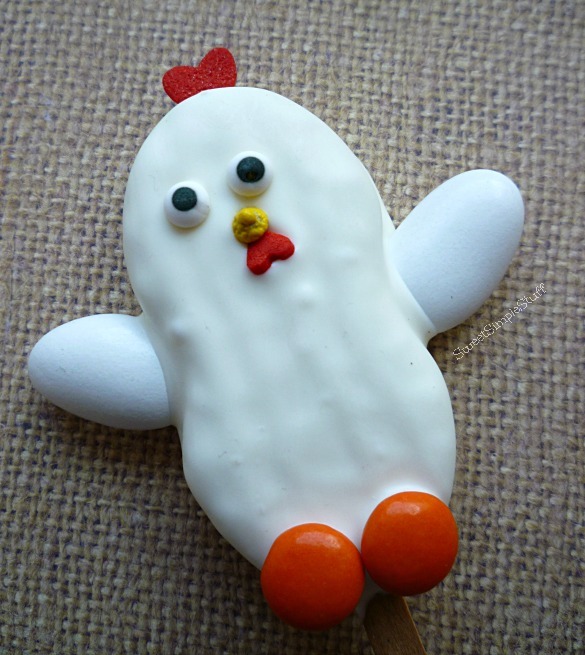 I love these little guys … or girls … easy to make and guaranteed to put a smile on everyone’s face. Melt candy coating. Line a tray with wax paper or parchment. Use the coffee stirrer to separate a Nutter Butter, use a little melted candy to attach the stirrer, put cookie back together immediately. Dip cookie into melted candy, tap off excess, drag bottom of cookie across the bowl’s edge to remove excess candy and place on prepared tray. Move to step 3 immediately. 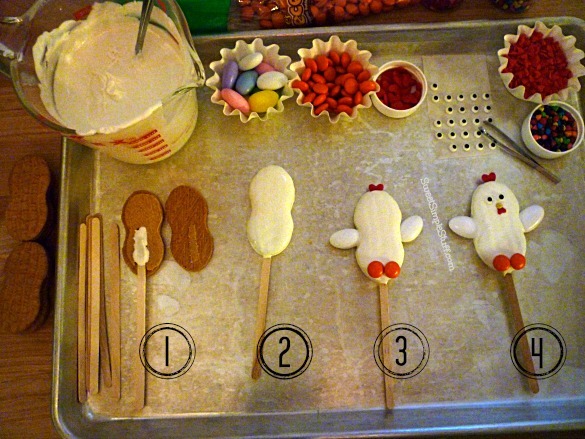 Place 2 Jordan Almonds against cookie to form wings, add 2 orange candies for feet and then add a large red heart in the top/middle as the “comb”. Note: it may be necessary to hold this still for a moment for it to stick, tweezers help! Chill to set or let sit at room temp. Use a dot of melted candy to attach small heart (wattle), beak and eyeballs. 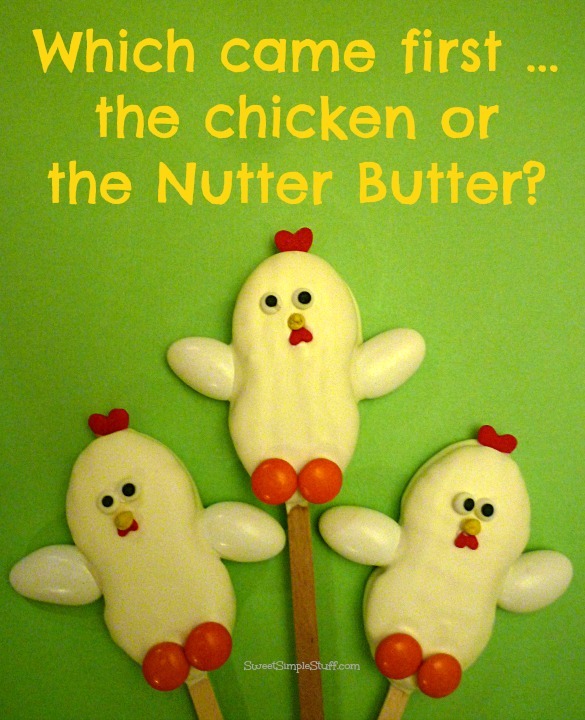 The Peanut Butter Man says … the chickens look like Casper (the friendly ghost) … silly man! … corrected himself rather quickly … also added that the Nutter Butter came before the chicken! Mmmm, I want those Jordan Almonds, Brenda. Are you and PB man on a week-long Spring break or just a day or two? What will the boys do for food while you’re gone?! Hi Kathleen! was gone for a girls’ weekend Friday to Sunday … hubby and I left Monday and won’t be home until Friday … hope they survive and learn to cook! Adorable!! I can’t wait to make these cute little guys! Spring break for the adults! woo hoo that sounds like the best plan I have heard so far. I also think your cute little chickens look like cartoon chickens. Do you remember tweetie? Hi Bobbi! Do you rEmember Foghorn Leghorn? I think these guys look like him as a youngster! I just made you Chai biscuits, dairy free … Excellent! I remember Foghorn Leghom…those were the times of the good cartoons. I am delighted that you tried my recipe. They are very addicting and healthy, you have to love that. Have a great Easter holiday! So – now you have mama chicks (the almond arms) and baby chicks (yellow M&M’s). Good going. Actually I think Peanut Butter Man may have inadvertently given you another great idea – Casper – who could be made at Halloween with a color and a few edible embellishment changes. Interesting how people see things so differently. WE immediately saw chicks while he saw something else. These are super cute!! I wish I saw them last week 🙂 I know a few kids that would have loved to have received these! 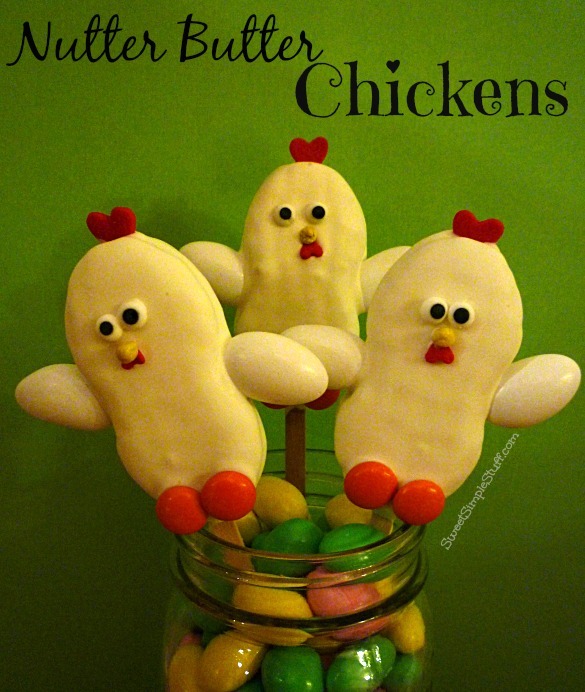 Thank you so much 😉 I made the chickens for Easter, but they would be cute for any ol’ day! I can’t get over how cute these chickens are! 😉 Love them! These look delicious AND adorable!!! YUm!